Every week, we showcase a new listing from our current inventory, taking a deeper dive into the features, options, and condition of the vehicle. This week, we’re highlighting this 2015 Chevrolet Silverado 1500 LT, equipped with the Z-71 Off-Road Package. Under the hood, this 4-door, 6-speed automatic holds a 5.3-liter V8 engine. The Z71 Off-Road Package includes an off-road suspension with Rancho shocks, all-terrain tires, a transfer-case shield, front tow hooks, and Z71 badges, stickers, and interior trim. 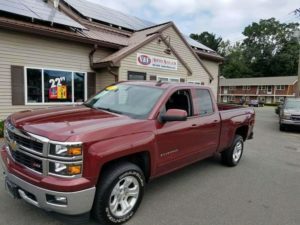 While not standard on this model, this particular vehicle includes the option of a 4×4 drive train and 18″ aluminum wheels. With only 42,115 under its belt and fours years on the road, this Silverado 1500 LT is a great find. The best part? This one has a factory installed remote vehicle start to help you survive these cold New England winters. Want to learn more? View the complete listing to check out more photos, request a VIN number, or check our availability for a test drive.